Wormsley is a private estate, home to the Getty family, and set in 2,700-acre (1,100 ha) of rolling countryside in the Chiltern Hills of Buckinghamshire, England. 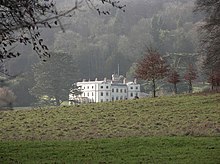 The Estate, which was acquired by Sir Paul Getty in 1985, forms part of Hambleden valley, running from Stokenchurch to Turville. Wormsley is world-renowned for its Library (which houses one of the finest collection of books and manuscripts in the country), its Cricket Ground (often referred to as one of the most beautiful cricket grounds in the world), its two-acre Walled Garden, its Shoot and the beautiful vistas and landscapes of the estate grounds. Today, Wormsley offers a wonderful secluded location for events, private dining, meetings, functions, product launches, corporate family-days, celebrations and weddings. The Estate is also a much sought after location for Television and Filming work and since 2011, continuing the Family’s long-standing support of the Arts, has also been home to Garsington Opera. It is now the private estate of Mark Getty and his family. Originally owned by the Scrope family since the late 16th century, the estate belonged to Colonel Adrian Scrope the regicide. The house and estate was passed to his grandson John Scrope a baron of the Exchequer and as Scrope died without issue, his estate of Wormsley passed to the descendants of his sister Anne (died 1720), who had married Henry Fane of Brympton. Their second son, Thomas Fane, also a Bristol merchant, succeeded his uncle as Member of Parliament for Lyme Regis, beginning the Fane family's long association with the seat. Fane also succeeded a distant cousin and became 8th Earl of Westmoreland in 1762. The Fane family retained ownership of the house and estate until 1986 when they sold it to Sir Paul Getty and his wife Victoria Holdsworth. After he acquired the 18th-century house, Paul Getty spent much time on restoring the house and estate back to its former glory. Getty also had a library added to the house to accommodate his book collection, and a theatre where performances were held for invited guests. In the summer months, Garsington Opera's annual festival is held on the grounds of the park. The area is known for its population of red kites. Once extinct in England and Scotland, the birds were reintroduced into England beginning in 1989. The area was not originally planned to be the first release site. It was originally intended to be Windsor Great Park, but at the last minute the landowner pulled out and the project nearly collapsed. Getty stepped in and offered Wormsley as an alternative, thus saving the project. In 2011, Garsington Opera moved from its original home in Garsington Manor near Oxford, to a purpose-built new pavilion in the grounds of Wormsley where it has remained since. When Mick Jagger introduced him to cricket, Getty formed such an affection for the sport that in 1992 he had a ground made in the grounds, with a mock-Tudor pavilion. The Queen Mother and the Prime Minister, John Major, attended the first match, along with Michael Caine, Denis Compton and Brian Johnston. Over the final decade of his life, Getty invited teams to play at what is now known as "Sir Paul Getty's Ground" with the teams ranging from world-class sides to youth sides. Amongst those who have played there are cricketers Andrew Flintoff, Imran Khan, Mike Gatting, Mike Atherton, Mark Ramprakash, Derek Randall, and Mike Brearley and entertainment figures such as Peter O'Toole, Tim Rice, and Rory Bremner. Touring international sides have played at Wormsley with the Australians, West Indians, Sri Lankans and South Africans all having made appearances at the ground. It was the venue for the only Test match of the Australian women's tour of England in 2013. ^ Christiansen, Rupert (2 November 2010). "Garsington gears up for glorious pastures new". The Daily Telegraph. ^ "About Wormsley". Wormsley Cricket. Archived from the original on 2011-04-23. Retrieved 2011-03-29. ^ Stephan Shemilt. "Women's Ashes 2013: New format, new era for England". BBC Sport. Retrieved 4 October 2015. Wikimedia Commons has media related to Wormsley Park. This page was last edited on 24 March 2019, at 18:53 (UTC).